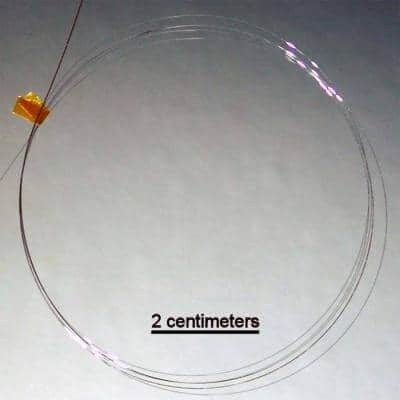 For the first time, a silicon-based optical fiber with solar-cell capabilities has been developed that has been shown to be scalable to many meters in length. The research opens the door to the possibility of weaving together solar-cell silicon wires to create flexible, curved, or twisted solar fabrics. The findings by an international team of chemists, physicists, and engineers, led by John Badding, a professor of chemistry at Penn State University, will be posted by the journal Advanced Materials in an early online edition on 6 December 2012 and will be published on a future date in the journal’s print edition. I’m a flexible solar cell, or nearly. The team’s new findings build on earlier work addressing the challenge of merging optical fibers with electronic chips — silicon-based integrated circuits that serve as the building blocks for most semiconductor electronic devices such as solar cells, computers, and cell phones. Rather than merge a flat chip with a round optical fiber, the team found a way to build a new kind of optical fiber — which is thinner than the width of a human hair — with its own integrated electronic component, thereby bypassing the need to integrate fiber-optics with chips. To do this, they used high-pressure chemistry techniques to deposit semiconducting materials directly, layer by layer, into tiny holes in optical fibers. Flexible solar cells for you iPhone? Badding explained that one of the major limitations of portable electronics such as smart phones and iPads is short battery life. Solar-boosted batteries could help solve this problem. “A solar cell is usually made from a glass or plastic substrate onto which hydrogenated amorphous silicon has been grown,” Badding explained. “Such a solar cell is created using an expensive piece of equipment called a PECVD reactor and the end result is something flat with little flexibility. But woven, fiber-based solar cells would be lightweight, flexible configurations that are portable, foldable, and even wearable.” This material could then be connected to electronic devices to power them and charge their batteries. “The military especially is interested in designing wearable power sources for soldiers in the field,” Badding added.